a couple of days after christmas we flew up to utah to attend my uncles funeral. my mom, siblings & i had gone up a week before christmas to see him & say goodbye, but it was very surreal when we heard that he has finally passed. he had battled with melanoma for the last year & a half which struck especially close to home because that is what my dad died from almost 19 years ago. it was a very bittersweet experience attending the funeral, it brought up a lot of emotions but, it was also comforting being surrounded by our family. all of my 28 cousins were able to make it to utah for the funeral, some of which i haven't seen since i was a kid, so it brought some happiness to the occasion. plus, my entire family was also together which is always fun. most of my family went home before new years, but we stayed behind to make more of a trip out of it since cedar has the week off from school. 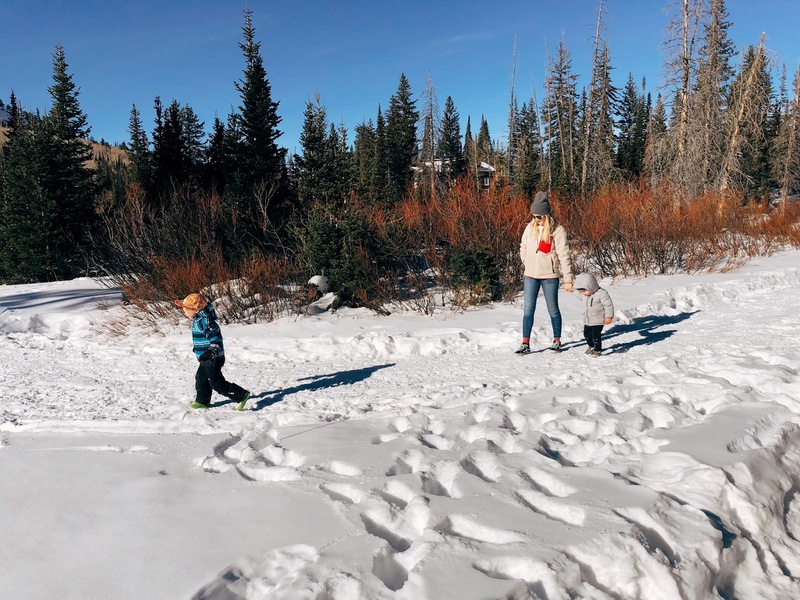 we've been having a good time with the boys & have been making daily trips up the canyon to play in the snow. cedar loves the snow. he has wanted to go play in the snow as soon as he learned that it was winter. he was completely convinced that it was going to snow on christmas day, despite the fact that i kept telling him that it doesn't snow where we live in california. a couple hours after he woke up on christmas day he came up to me & said "mom, i think you're right. it doesn't snow in newbury park, but i think it might next year." he has all the faith in the world that it will snow one day, haha. he has totally loved tromping about in the snow & making snow angels. it's so cute when he does it. he jumps straight in to knee deep snow & goes wild with his arms & legs, it's so funny. milo on the other hand isn't so sure, but he totally loved sledding & cedar loved pushing milo on the sled.